As the 24-hour mark approached in the aftermath of the tornado that swept through a large swath of suburban Oklahoma City, emergency crews on Tuesday continued to search for survivors. At least 24 people were killed, including nine children, and those numbers are expected to climb. Disaster expert Dr. Matt Levy, an assistant professor of emergency medicine at Johns Hopkins Medicine in Baltimore --who also heads up the Maryland Disaster Medical Assistance Team -- said to CBSNews.com that the goal is to extricate survivors as soon as possible within the first 24 hours, with risk for fatalities rising as time passes. However, he points out that survivors have been found within two to three days in previous disasters, or even longer. Earlier this month, a seamstress was pulled from rubble 17 days after a building had collapsed in Bangladesh, killing more than 1,000 people. Her case is more an exception to the rule. Levy has not been involved in the care or rescue of patients in Oklahoma. 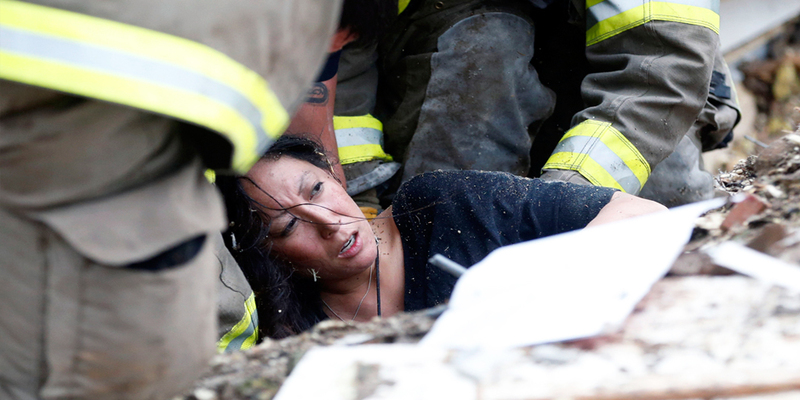 Several factors go into how much time a survivor has when trapped by debris, explains Dr. Robert Glatter, an emergency medicine physician at Lenox Hill Hospital in New York City. "Ultimately, survival is related to pre-injury medical status and function, as well as the person's ability to withstand hyperthermia, and elevated levels of carbon dioxide in a confined space," Glatter, who is not involved in the rescue efforts, said in an email. People may sustain potentially dangerous injuries to their extremities like their arms and legs, caused by falling masonry or beams in a building, according to Glatter. This can cause swelling, numbness and tingling and progress to a dangerous condition called "crush syndrome." "One of the main concerns after a tornado is the development of crush syndrome (traumatic rhabdomyolysis)," said Glatter. That's "the development of kidney failure and shock after a crushing or traumatic injury to skeletal muscle." What happens is that the crushing pressure causes the muscles to break down and release potassium, phosphorous, myoglobin and other compounds that are harmful to the kidneys. That in turn can progress to kidney failure and death. Pinned limbs are also at risk for "compartment syndrome," a painful condition in which pressure buildup stops blood flow, and could result in the loss of a limb. People with these conditions may require aggressive IV fluids to boost their blood flow and prevent kidney failure. But as Glatter mentioned previously, more risks remain. People with preexisting medical conditions who can't access their medication may face added risks. Carbon monoxide, an odorless gas, can build up in enclosed spaces following a disaster like a tornado, according to the Centers for Disease Control and Prevention. That could be from a stove or natural gas source in the home. Access to food and water is also crucial, with some longer cases of survival, including the woman in Bangladesh, being aided by access to water. Dr. Thomas Kirsch, an associate professor of emergency medicine and international health at Johns Hopkins School of Medicine and the Bloomberg School of Public Health in Baltimore, previously told CBSNews.com that lack of water is most deadly as it can lead a person to become delirious or lose consciousness, and can result in death within a week. Even small amounts of water can be life saving. Without access to food, the liver will break down glycogen, a stored form of glucose, according to Glatter. After about a day, the body will turn to breaking down fats and fatty acids for energy, then within three or four days, the body will start to break down muscle. "You essentially break your body down for energy to survive," he said. Levy added that there are particular challenges in a pediatric emergency response. Some young children may be more susceptible to head injuries or exposure from the elements, which can lead to dangerous changes in body temperature. Some young children have been shown to display resilience in the aftermath of a critical injury with the body able to compensate -- but Levy said after this period, their condition can deteriorate rapidly, adding to the urgency of rescue. Being trapped for a long period of time can also take a heavy psychological toll. Some survivors have recalled playing "mind games" to stay alert while others have said they put themselves into a trance-like state to cope with the isolation, Glatter pointed out.